Giving away big prizes on the leaderboard rankings alone is fraught with difficulty for novice managers – is the game fair? do all players stand an equal chance of succeeding? do they all perform the same activity at the same time? are my metrics correct? In many cases the answer to these questions is no. If that’s you then giving away prizes can quickly become a quagmire of player complaints. To counter this I now recommend running a weighted raffle at the end of the leaderboard score period to give away prizes. The advantage of a weighted raffle is that it still benefits those who have worked hard to do well on the leaderboard but it also gives those who haven’t done so well on the leaderboard, for whatever reason, a chance to win the overall prize. This is ultimately a more engaging way to give out prizes. The leaderboard becomes primarily a feedback mechanism showing players how they are doing versus peers on the behaviours they already want to do. The lottery (raffle) becomes the reward mechanism that marketers in particular like to use to motivate players to engage with the experience in the first place. To provide the weighted randomised draw Leaderboarded has partnered with specialist firmRandomPicker.com that will do the draw in an auditable and fair way. As one of our channels we now offer an easy way to export all players and their scores (the number of raffle tickets) into a special format accepted by Random Picker. 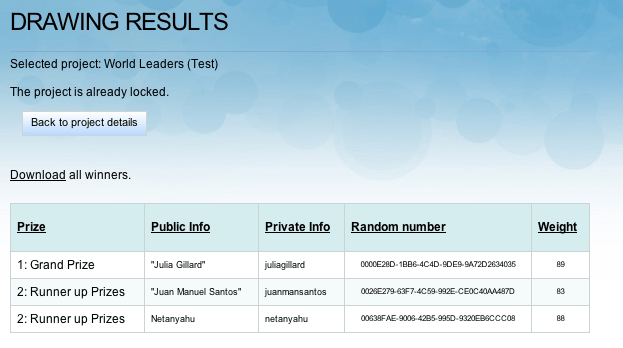 Full guidance is provided in our Knowledge Base article How to run a weighted raffle using Leaderboarded scores. We look forward to hearing how you get on.